I think this is what an old-fashioned commemorative medal would look like if something like the Nine Years’ War took place today, with Barack Obama as William of Orange. They seem to share a similar self-perception: “IOVI TONANTI” (Jupiter the Thunderous). We’re in for trouble if there is a modern-day Treaty of Ryswick that produces the same approximate result. 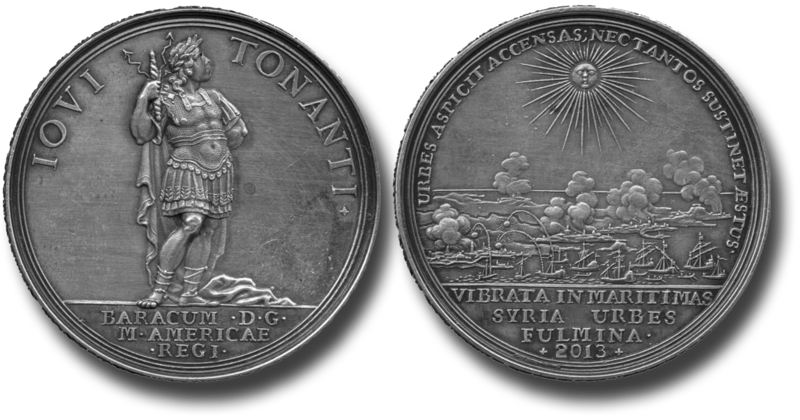 Barack Obama, The Syrian Coast Bombarded, Silver Medal, 2013, by Philipp Heinrich Müller, Barack as Jupiter standing in the armour of a Roman general, IOVI TONANTI , rev ships bombard the coast, URBES ASPICIT ACCENSAS … , with VIBRATA IN MARITIMAS … in ex, lettered edge, by F. Kleinert, VANGIONVM … , 47.5mm (MI 98/323; Eimer 358; MH 113; vL IV, 167; Foster 688). Extremely fine and rare. A squadron under Vice Admiral Frank Craig Pandolfe bombarding several Syrian coastal towns. This entry was posted in Coins, History, News and tagged barack obama, humor, Obama, Politics, satire, Syria. Bookmark the permalink.